This book is about a little girl, Savita, who travels back home to Kenya, East Africa after visiting relatives in her ancestral land of India. Mubina Kirmani has produced a story rarely told about Kenya. She highlights Indian-Kenyans, a marginal community that has been important in the economy of the country. The central characters in this charming picture book are Savita, an Indian-Kenyan and Njeri, a Black Kenyan. Young Savita is returning to Kenya in a dhow (sailing ship) with her mother and baby brother after visiting relatives in India. 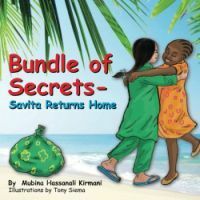 Throughout the month long journey across the Indian Ocean, Savita cradles a “bundle” that Mother says must not be opened until she gets home. When Savita arrives in the Kenyan port city of Mombasa, her dad and friend Njeri are waiting for her. At home Savita and Njeri watch as mother opens the “bundle” (which contains spices). Together they prepare muhogo wa nazi (cassava cooked with coconut milk).